This video explains why it's all about the fold hold. New York mayor Bill de Blasio caught major flak earlier this year for eating a pizza with a knife and fork. (The offending cutlery ended up fetching $2,500 at a charity auction, incidentally). 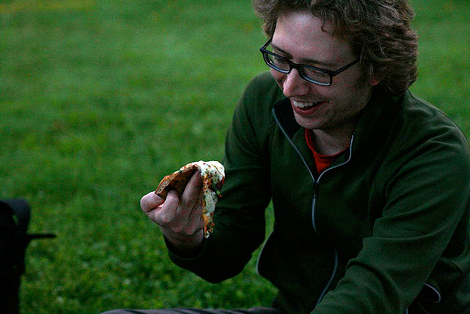 The “pizzagate scandal” had folks riled up because—hello?—everyone knows that you’re supposed to eat pizza with your hands. * And science says that the good old fold hold is the best technique for manual slice consumption. 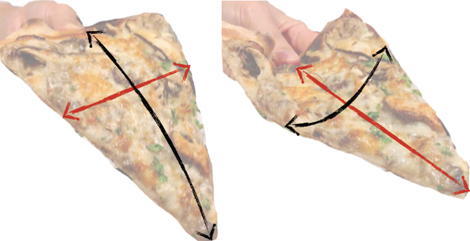 Basically, bending a pizza slice one way makes it more rigid the other way. You probably already knew that from experience, but now you can bore your dinner companions with the geometry behind it. *Unless we’re talking about soupier Neapolitan pies, but let’s not get into that argument right now.